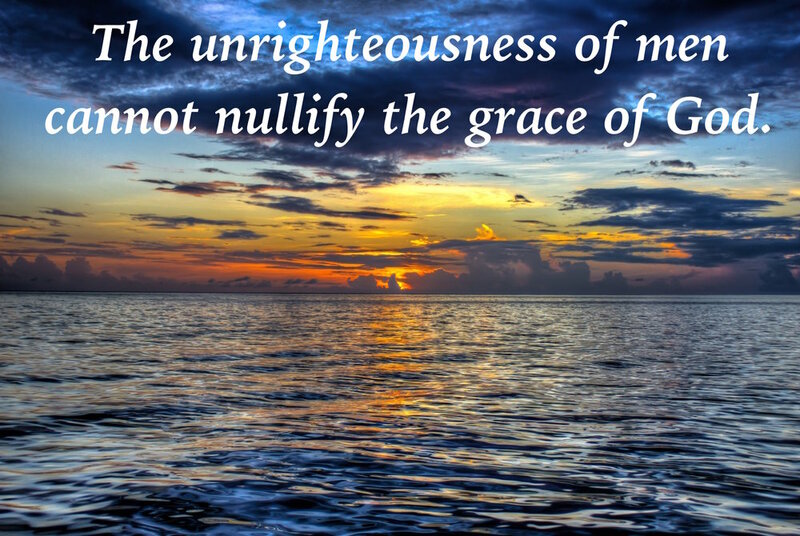 The unrighteousness of men cannot nullify the grace of God. This is a paraphrase from a sermon I recently heard, and I was struck by the importance of this simple truth. And yet, even in its simplicity, it is a truth far too often ignored in some Christian circles. It seems that, in our sweeping attempts to avoid the dangerous error of a "seeker-sensitive" mindset, we find ourselves swinging the proverbial pendulum too far in the other direction. As a consequence, we find ourselves stressing holiness and righteousness—and rightly so—but we find these being stressed at the expense of God's grace. And we, with Paul, heartily exclaim, "May it never be!" (Romans 6:2). Still, it behooves us to remember that the gospel is indeed a gospel of grace, and without that glorious, divine grace, no man would be saved. The true Christian, then, will never affirm the mindset that says that one can be a Christian without demonstrating any fruit of a changed life, heart, and mind. In the same way, most doctrinally sound, biblical Christians would not affirm a gospel of legalism that says that one must do something to contribute to his own salvation. Sadly, there is a type of legalistic mindset that unfortunately still distorts the gospel of grace. Such a mindset is found in teaching that stresses a list of Do's and Don'ts, even dictating one's emotional response to a biblical text. It is a mindset that, whether intentionally or unintentionally, implies that God's grace is affected by and dependent on the unrighteousness of men. "Your heart should be bursting when you read these words!" But...what if it isn't? What if I do not feel overjoyed and elated when I read such-and-such a passage? Have I done everything the pastor said that passage told me to do? Have I felt everything he said I should be feeling? Oh no, I haven't! Am I in sin? Am I even saved? And so the spiral begins. These subtle stabs of uncertainty about one's acceptance before God can cause even the most stalwart Christian to slump under the heaviness. Yet, for the Christian who is in fellowship with God, who grieves over his own sin, and who loves the Lord, this heaviness should not be. There ought instead be joy, contentment, and peace, whether in times of trial or times of happiness. Why, then, is this absent in the lives of so many Christians? This writer proposes that it is due to a lack of the proclamation of God's grace. When the gospel is presented in anger, the grace of God and His mercy toward and love for sinners cannot be seen. When Bible teaching is characterized by to-do lists and instructions that even dictate one's emotions, there is no room for God's grace. It is suffocated by man's rules and expectations. The student sitting under this teaching is far too busy attempting to measure up; he is too consumed to even consider that, when he stumbles, there is grace. In fact, I daresay that the reaction of many individuals exposed to this type of teaching is more of a reaction of fear of man than fear of God. What if the pastor/elders/deacons/person next to me doesn't think I'm a good enough Christian? Well, I have some news for you: you aren't a good enough Christian. Neither am I. Neither is your pastor. None of us, in our own power, can live the Christian life that we are called to live. So, how is that going? Not too well, I'd guess. If, that is, you are striving for perfection on your own. But there is good news for the Christian. God does not save us and call us to holy living and then drop us, leaving us to pull up our own spiritual bootstraps and muddle through the murkiness of life on our own. You see, it is the Holy Spirit dwelling within us who enables us to live a life worthy of the gospel by which we have been called. Furthermore, when God the Father, in His thrice-holy omnipotence, looks upon us, He sees, not the dirty rags of our pitiful, sin-filled offerings (Isaiah 64:6), but the perfect and spotless righteousness of Christ (Ephesians 2:13). Indeed, if we have been saved, we are in Christ. And when we, in our constant struggle against the flesh, sin against our Lord, there is mercy, grace, and forgiveness (1 John 1:9). We do not live a life that yields to sin; however, we also do not live a life of fear that, when we sin, we have somehow forever forfeited the blessings of God that He has promised to us. Consider the patriarchs, Abraham, Isaac, and Jacob. These were not perfect men. God made a promise that He would make Abraham a great nation and, in spite of Abraham's sin and the sins of his sons, God did; Israel did indeed become a great nation. Further, God promised that the Messiah would come from this people. And, in spite of the great sin of Israel, Messiah did come from that people. Consider even the great sin of Judah in Genesis 38 and yet, Jesus Christ is the Lion from the tribe of Judah (Revelation 5:5; cf. Matthew 1:3). God keeps His promises. The fact that God works all things, even sin (though, to be clear, God is not the author of sin), together for the good of those who love Him and keep His commandments (Romans 8:28) does not give the Christian a license to sin; however, it does give the Christian a right view of God. God is high and lofty and His ways are far beyond our comprehension, but He is not unreachable. When the Law of God is preached and taught at the expense of the grace of God, we find that He suddenly becomes a distant deity who, like the preacher who is distorting His Word, cannot be pleased. But God is not an angry, far off, supreme being who desires no interaction with His creation. He is near, and He cares for His creation, and He has lovingly provided a way for us to be reconciled to Him. God calls us by grace, He saves us by grace, He sanctifies us by grace, He disciplines us by grace, and He will one day glorify us by grace. How amazing is this grace. How amazing is this God. How amazing is the grace of the Lord Jesus Christ.